The building features Insulating Concrete Form (ICF) construction. The recently renovated James S. Wilson Middle School near Erie is one of the “greenest” schools in Pennsylvania. 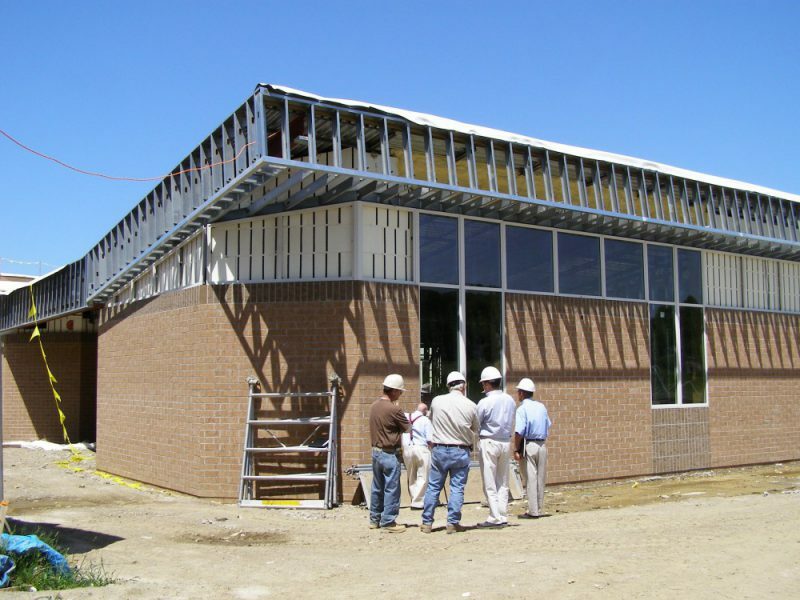 The architect’s use of insulating concrete forms (ICFs) for its building envelope was a major factor in helping the school earn that designation. J. S. Wilson M.S. was a long time in the planning. 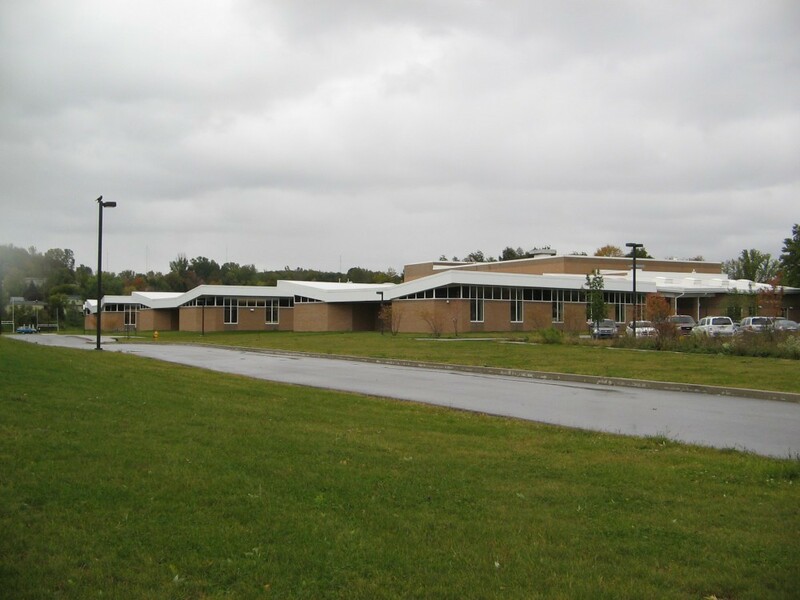 In 2001, when Mill Creek Township School District started the process, they were interested in energy efficiency, but it was not a driving concern. That changed over the next few years as the price of fuel rose dramatically and the concepts of green building and LEED (Leadership in Energy and Environmental Design) accreditation gained wider acceptance in the building community. The school district chose the architectural firm of Hallgren, Restifo, Loop & Couglin to design the school renovation. “We had reached the end of the design/development stage of the drawings when the school district expressed an interest in green building. They had attended a conference about high performance school buildings,” says Chris Coughlin, principal in the firm. “From that point on, we started reviewing green items and over the course of the next two to three years, we toured the country looking at high performance schools. We originally intended to do the school as a LEED project, but as we went through the bid process that was an expense that unfortunately had to be cut. We did follow the LEED principles, however,” Coughlin adds. The design of J .S. Wilson M.S. turned out to be a learning process for all parties involved: architects, school board members, administrators and teachers, students and their parents and the community at large. The school board and the architect held numerous meetings over the course of several months to educate residents about their plan to build green and to get their support for that effort. In turn, the questions that the members of the community raised made the school board and the architects think even more carefully about their design choices. These interactions ultimately produced a school that was not only energy efficient, but that also met the specific needs of the Mill Creek Township community. The district received a $25,000 Green School grant from the state to help finance the $22 million project, which was completed early in 2008. The school’s green design started with the reuse of a good portion of its original structure. “The school was originally built as a junior/senior high school with a full-size cafeteria, a full-size gym and an auditorium that seats almost 1,000. We knew that in this economic climate, if we went back to replace them, we would no longer have that. We would have a multi-purpose room—or a multi-useless room,” Coughlin says. “The greenest thing we could do was to keep as much of the original building as we could.” The school district ended up replacing and adding approximately 60,000 square feet to what was left of the original building, bringing the total structure to 136,000 square feet. “We removed the original two-story structure, which had an inappropriate orientation to the site because the main façade with all the glass faced east and west instead of north and south,” Coughlin says. The school is now one-story, except for a two-story mechanical room that allows networking and HVAC systems to run through the ceilings. The design added classroom pods, a library and offices, but not in the original footprint. “By changing the classrooms to a north/south orientation, we were able to control the light better,” he explains. The original structure’s masonry and brick walls were not insulated and contained no air space, which resulted in efflorescence on the interior walls. To improve the thermal envelope, the contractor, Perry Construction, removed the exterior brick, created an air space, added insulation and faced the building with new brick. The exterior walls of the new sections were built using ICFs faced in the same brick. Coughlin’s firm first learned about ICFs while attending a seminar in Harrisburg on high performance schools. “As we got more into green building, we went to great lengths to specify local products. Unknown to us before this conference, the ICF manufacturer’s production facility was just a few miles away from our office. We toured their facility and were quite impressed,” Coughlin says. They also liked the fact that ICFs offered them more design flexibility, allowing them to create 45 degree walls, for example. 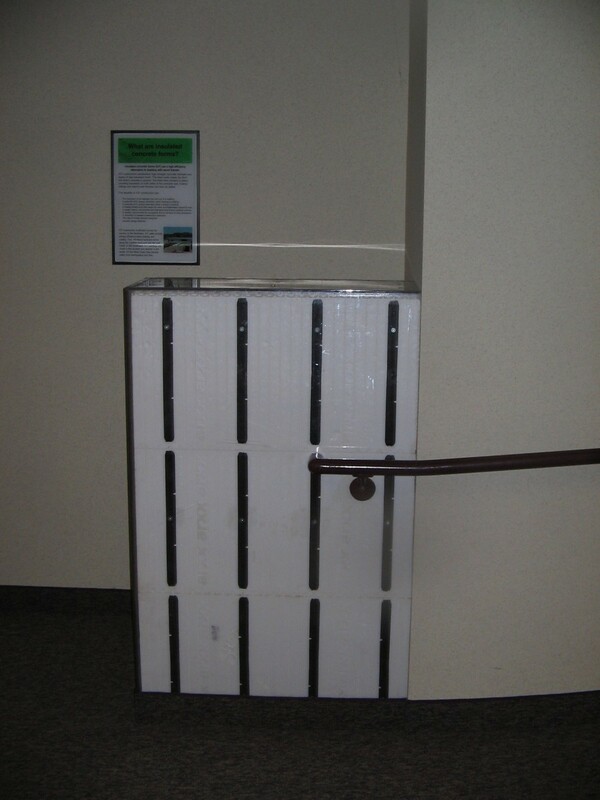 The ICFs were readily available, unlike steel, which is often delayed. The cost of ICFs is comparable to steel as well. “One of the big things I noticed was the speed at which the ICFs were erected, and how they could be erected in inclement weather. That was particularly important in the time frame that we were building in – October through January,” Coughlin adds. The use of ICFs helped boost J. S. Wilson’s green building bragging rights. “One of the things that you get credit for in green building is not being redundant,” Coughlin explains. “We didn’t have the typical stud wall cavity with insulation and steel beams and steel frames. 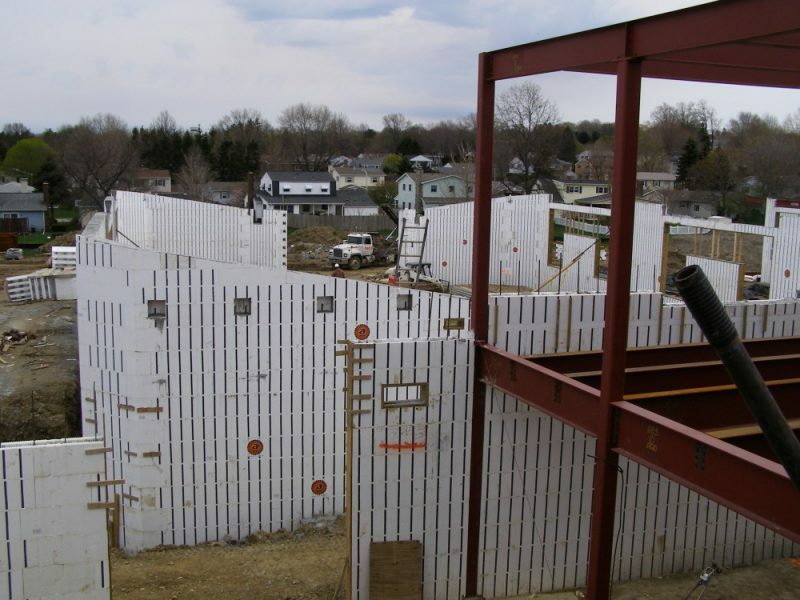 With the ICFs, building our walls with concrete and insulation was just one process. So it really streamlined the construction.” The ICF walls are used as load-bearing walls throughout the building. 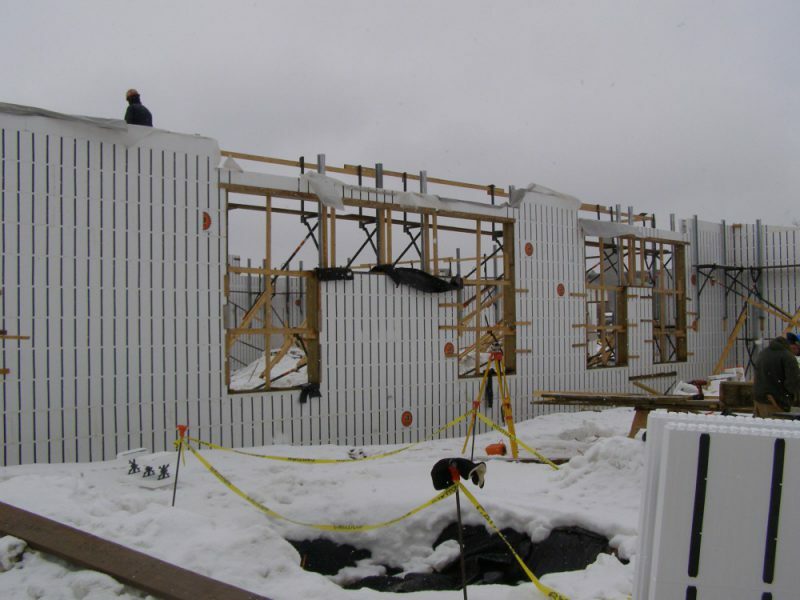 The heat-preserving attributes of ICFs were especially notable during construction, when contractors enclosed sections of the building already constructed so they could continue work on them. “It was probably the warmest building that I’ve been in on a project site where they were using portable gas heaters in the middle of winter,” Coughlin observes. Although ICFs accounted for the largest use of concrete at J. S. Wilson, concrete played a role in other ways as well. Heated concrete walks at the bus entrance and the main entrance and a radiant concrete floor in the vestibule have greatly reduced the amount of maintenance required for the school’s lobby and main corridor. Concrete from the demolition of the original building was crushed and used as fill and a base for walkways and driveways. Providing students with the opportunity to observe and interact with the school’s environmental design features is an integral part of the J. S. Wilson project. They can see a small section of the ICF wall exposed and wrapped in Plexiglas, then read the nearby sign that explains how an ICF works. When it rains, they can watch the water collected on the roof travel down through glass tubes to storage tanks below, where it’s purified and used for flushing urinals. They can see overhead the pipes for the geothermal system that goes down into 300-foot wells and provides most of the school’s heating and cooling. They can compare the flow of a water spigot powered by the school’s photovoltaic panels to the flow of a spigot powered by its windmill simply by looking through a window at the front of the school. They can measure the natural light coming into the building through the large, dual-glazed, low-E, argon-filled glass windows to determine when they should switch on the overhead light, and determine how additional lighting can impact the school’s heating and cooling costs. Today, as students pass the exposed ICF wall and enjoy the comfortable indoor temperatures that ICFs make possible, they’re learning about the role that concrete plays in green building. It’s a lesson that they’re likely to remember over the coming years.